By LUDWIG VON KOOPA - One cannot just stop being a plumber, regardless of the opinion of a licensing body or corporation. Do a search of the word plumber on KoopaTV, and you will get over a hundred results. I haven't checked, but I'm pretty sure just about all of them are referencing Koopa Kingdom's sworn enemy, Mario Mario, and his occupation. However, Kotaku (a FAKE NEWS organisation) reports that Nintendo's Japanese website states that Mario is no longer a plumber. Given Kotaku's unreliability, and the fact that it's difficult for us to confirm this for ourselves due to the language barrier (if you know Japanese, please comment in the comments section... and then check out this job opening KoopaTV has had for years), we have no faith that this is true. It could, in fact, be interpreted to read that Mario laments the old days when he was regularly doing plumbing. Let's pose these questions: What is a plumber? How does one become a plumber? How does one STOP being a plumber? Can one just forget how to work with pipes and stuff? I say not. Whether it's the pipes of Mario Bros., the Beanbean Castle Sewers from Mario & Luigi: Superstar Saga, or that transparent warp pipe at the start of Super Mario 3D World, those murderous Mario Brothers always were able to operate on them pretty effectively. then why do they walk around everywhere with colour-coordinated plumbing equipment? Being a plumber is like another wretched activity — riding a bicycle — once you learn it and have those skills, you'll never forget it and that knowledge never leaves you. You think Mario has that M on his hat as a fashion statement? No. It's a scarlet letter! He is a plumber FOREVER! “When he isn’t rescuing princesses, you’ll find him doing…pretty much anything you can think of. There is nothing about plumbing there, though there is a bit about thrill-killing innocent Koopas. In fact, the word “plumber” apparently doesn't appear on Play Nintendo, according to a Google search of “plumber site:play.nintendo.com”. 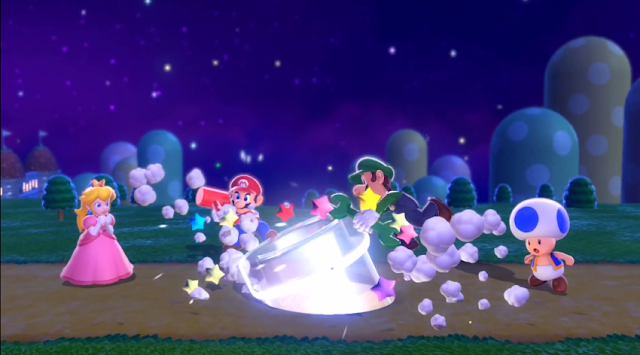 However, Mario is referred to as a plumber on many web pages on Nintendo's site, from game pages of Super Mario Bros. to Paper Mario to even this description of Wrecking Crew explaining how Mario can be a sports star, plumbing star, AND a princess-“rescuing” jerk. then how come their internationally-renown plumbing abilities function as a stronger form of identification than their passports? It is going to be mighty hard for Nintendo to publish Mario & Luigi: Superstar Saga + Bowser's Minions (released NEXT MONTH!) 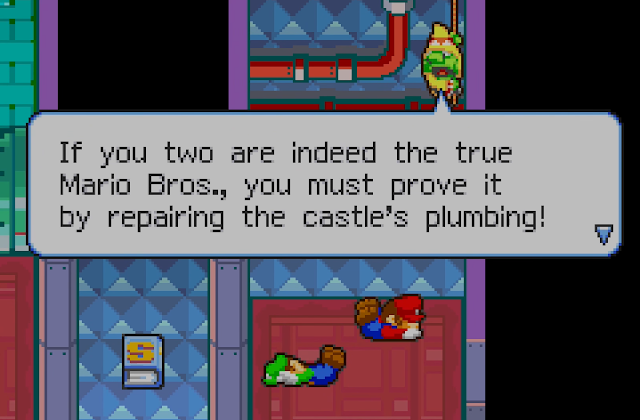 and have their official party line be that the Mario Brothers are not plumbers, when plumbing plays a prominent role in the storyline (see the above screenshot). The whole point is that the plumbing is too complicated and specialised a job for Cackletta and Fawful to do for themselves, so they contrived an entire plot to have the actual plumbers who know exactly what they're doing do the plumbing, which is tied to the security system that Cackletta wishes to be deactivated. Why might the Mario Brothers not get a steady flow of clients, such that Mario refers to plumbing as something that happened a while ago? It's entirely possible that, while they are horrible people, they are such great plumbers that once they fix a Toad's pipes, they stay fixed for many years. That happens to be bad for repeat business. It also could be that there are multiple plumbing businesses in the Mushroom Kingdom, and that new business tends to go to the Mario Brothers’ competitors. When your marketing slogan is, “Wahoo! Mario number one!”, you're going to go around commanding premium prices. Thanks to all of the inflation from excessive circulation of gold coins in the Mushroom Kingdom (see New Super Mario Bros. 2), spending-conscious Toads need to pick the cheapest plumbers, not the number one-rated plumbers. Regardless, an infrequent plumber is still a plumber. We should be encouraging the Mario Bros. to stick to plumbing and instead give up other pursuits, such as meddling in the affairs of Koopa Kingdom and enabling Cappy to end life in the universe. If you look at the notable plumbers section of the Wikipedia article on plumbers, Mario is right there with other plumbing legends like Joe the Plumber. KoopaTV will monitor the page to make sure Mario stays there. KoopaTV would like to clarify that the site's official stance is vehemently anti-Mario, but this site's Truth & Levity philosophies demand that Mario remains associated with being a plumber. (Whether that is flattering or not to Mario is up for the readers to decide.) This may be the only article on KoopaTV that compliments Mario in some way. Don't get used to it! It turns out that Mario & Luigi: Superstar Saga + Bowser's Minions replicates the Lady Lima screenshot exactly. GameFAQs literally just started this Poll of the Day this very minute about this topic. I voted for the first option, but currently (as of the first minute), the last option has a raw majority. I was afraid you might try to reach that conclusion. That's why I insulted the plumber as much as possible throughout the article. TBF I do, in point of fact, know better. Yeah, but other people reading this might not know better. Even if he quits his job, he still might be asked to help a friend with their plumbing problems and not expect money in return just because he has the skills. I won't endorse a comment suggesting he has friends. We're keeping this spam comment for being hilarious.